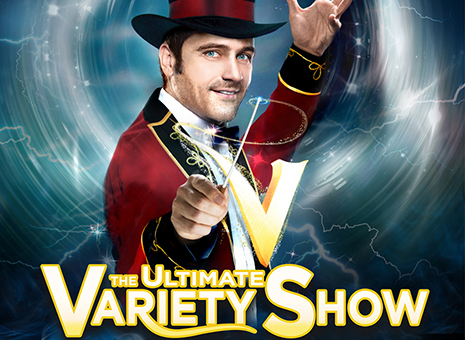 V - The Ultimate Variety Show presents the most astounding acts from around the world, in one high energy spectacular that is guaranteed to entertain audiences of all ages. Whether you are looking for magic, special effects, Death-Defying stunts, wild physical comedy or you just want to have a really good time, then "V" is the show for you! With a constantly rotating cast of world renowned acts there is always something new to see! Come see what is consistently rated one of the top variety shows in Vegas. If you are in Las Vegas and can't decide between that really great magic show or those incredible acrobats, don't worry! You can see acts like that and more when you come to V - The Ultimate Variety Show. With shows nightly, "V" makes the perfect addition to any vacation, a family-fun night, or just a night out with friends. The V Theater, located inside the Miracle Mile Shops of the Planet Hollywood Casino, provides the perfect intimate setting so that everyone can get up close to the action. Want to really experience all of the acts close-up? There are plenty of VIP seats that put you right up front you almost feel like you are part of the show! Come see why this is one of top rated shows in Vegas year after year. Don't wait, pick up your tickets right now! .